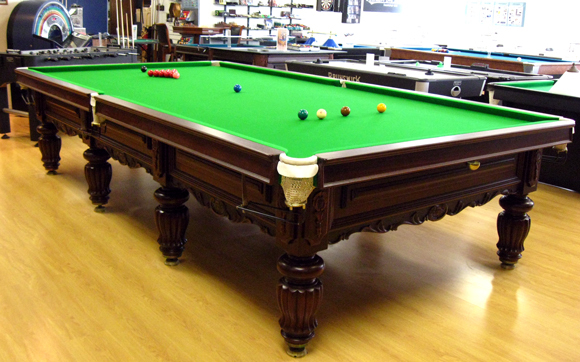 Barton McGill Billiards is a long established Billiards, Snooker & Pool table specialist company that offers a comprehensive selection of Billiards/Snooker/Pool Tables from the World’s best brands, Antique Billiard Tables, Restored Tables, Games Tables, Games-room Furniture and Accessories. It is the mission of our company to offer our customers the finest quality available combined with outstanding service and backup. Fully & beautifully restored, presents as new. Very few numbers of this table were ever made, with four being chosen and used exclusively for the World Snooker Championships in 1986, when only the best playing conditions were required for the world’s best snooker players. The magnificent table we have on offer is an example of the exacting craftsmanship of the billiard table makers from Barton McGill and represents a “once in a lifetime” opportunity to own this quality. Handcrafted back in 1983 by Barton McGill at their factory in Auckland, NZ. Made from solid African Mahogany, rich in figure and beautifully finished in Mirrortone scratch resistant lacquer. Featuring Italian Monte Balano five piece two (2″)inches thick slates weighing one Tonne with the cushions bolted directly into the slates for ultimate speed and a silent true rebound. NZ’s master wood carver Neil turner Individually hand carved this table. Acanthus leaf scrolls & leg panels adorn the rails and compliment the magnificent ten-inch diameter hand turned reeded legs with brass adjustable levelling toes. represents a “once in a lifetime opportunity to own” this piece of history. adorn the rails and compliment the ten-inch diameter hand turned legs. 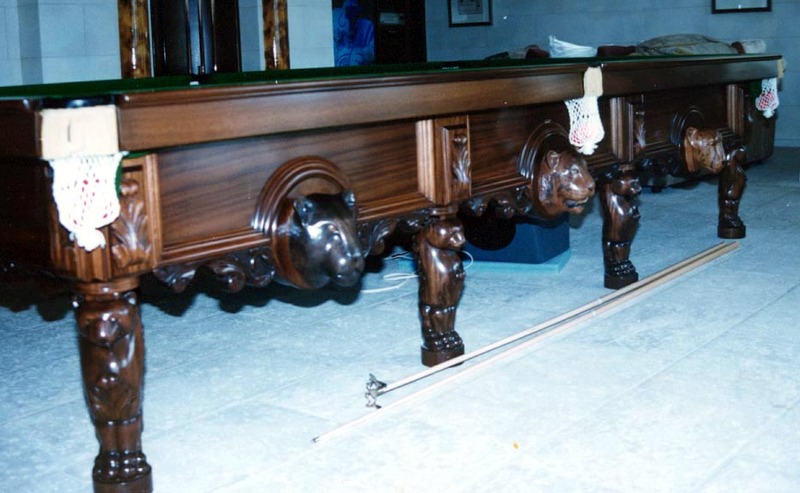 The building of Traditional Billiard Tables, including the blending of finest materials with outstanding craftsmanship, demands attention to detail and constant quality development. Scientific construction methods and Barton McGill’s ability to match climatic issues, mean these final structures will never bend, crack, shrink or twist with age. Traditional materials are carefully balanced and matched. All slate beds are imported from Italy and each table is hand floated in its frame, ensuring total flatness and finished to stand the test of straight edge and level. Cushions are of West African Mahogany or selected hardwoods as below. Absolute rigidity and straightness are maintained by 6.5″ fixing bolts. The combination of natural rubber on solid timber results in perfect ball speed and truth of rebound. The rubbering of cushions is one of the most skilled jobs undertaken by our craftsmen. Using 100% pure rubber, it is all done by hand, with great care and precision to our registered SLC (Standard Low Cushion) Design. The entrance to each pocket is uniformly undercut to open out past the fall of the slate, and conforming to the standard template of the World Governing Body. Frames are made from solid West African Mahogany and the slate bearers are South American Cedar. The whole structure is Dry Dowelled and held together by large 12″ steel bolts. Supporting the frame and slates are hand turned solid mahogany legs, each fitted with adjustable toes for ease of levelling. Cloth is imported from West England’s famous Strachan, manufacturers of the finest pure Merino-based cloths. World Championships for over 100 years have been played on these immaculate playing surfaces. Strachan cloth is strong and tightly stretched over the slate bed, ensuring an imperfection-free and true ball path across the entire table. 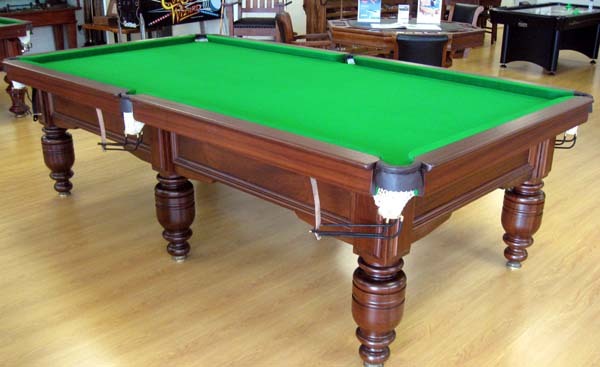 With 120 Years of Billiard Table Manufacturing experience, Barton McGill stands by each table with a lifetime guarantee. If you are not completely satisfied in every way, let us know! A masterpiece of the craftsman’s art. Beautiful African Mahogany, ornately hand carved and polished to a mirror finish, with massive 2″ thick Italian slate, hand floated and covered with Strachan’s Superfine cloth. Often used in the World Snooker. Traditional elegance combined with handcrafted quality has proven the Fullsize Traditional to be a favourite amongst the players. Selected and for many National Tournaments and World Billiards Championships. The Champion of Tables. The Victorian is an antique reproduction of one of our original table designs. Handcrafted in the warm glow of NZ Rimu and enhanced by a natural satin lacquer finish, the Victorian will remain a true work of art. “An Heirloom for Tomorrow”. Avail in 8ft and 9ft sizes. The Traditional 9ft is not only selected for its classical lines but for its enduring quality and playability. The finest Italian slate a full 1 1/2″ thick ensures a silent and true playing surface.Timeless Quality. Available in 9ft and 10ft sizes. An investment for the family that will last for generations, the 7ft Victorian complements any elegant home. Handcrafted in solid exotic hardwood and fitted with 3-piece 1-1/4″ thick slates plus hand carved leg scrolls.Quality and Style. Avail in 7ft and 8ft sizes. Imagine the Traditional 7ft Table in your home. The classical elegance and fine lines blend into any surroundings. Available in a variety of solid timbers and a choice of finishes, continues to be a favourite.The Favourite. Available in 7ft and 8ft sizes. Commissioned and designed for a wealthy businessman, the table is fashioned from quarter sawn Cameron Mahogany which was hand selected for its grain and beauty. The table body has large hand carved medallions featuring New Zealand sporting scenes in, rugby, cricket, golf, swimming, tennis and racing. The massive eight legs are again fully hand carved which support the “hand floated” 2″ thick slates weighing over one tonne. Barton McGill’s fully hand carved table was the most expensive table made to date. Commissioned and designed for a wealthy businessman, the table is fashioned from quarter sawn Cameron Mahogany which was hand selected for its grain and beauty. 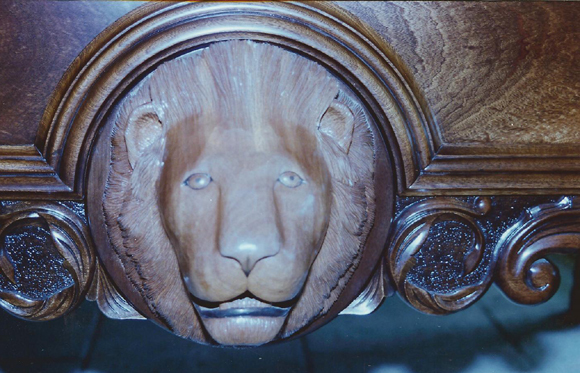 The table body has large hand carved medallions featuring lions, tigers,and jaguar heads.The heads protrude from the table and are colored by hand to give a life like appearance. The massive eight legs are again fully hand carved lions standing upright which supports the “hand floated” 2″ thick slates weighing over one ton. Barton McGill offer selected Hardwood timber finishes plus a range of cloth colours to compliment your room’s decor.